Hyundai today confirmed that it will showcase its new CarPlay-enabled Display Audio system next month at CES 2015. Display Audio is a dash-installed color touchscreen display that supports the latest in-car handsfree technology. Hyundai's Display Audio forgoes built-in navigation and CD player features, instead including support for Apple's CarPlay and Android Auto to allow drivers to make phone calls, listen to music, send messages, and get directions using the car's in-dash display. The system also integrates with the voice command button on the steering wheel, providing drivers with an easy way to launch Siri Eyes Free commands. Hyundai plans to roll out the Display Audio system with CarPlay support in select 2016 Hyundai models, which debut later in 2015. The system then will become the default head unit across the company's automobile lineup. Hyundai was among five brands of automobile manufacturers featured by Apple during its CarPlay announcement earlier this year. 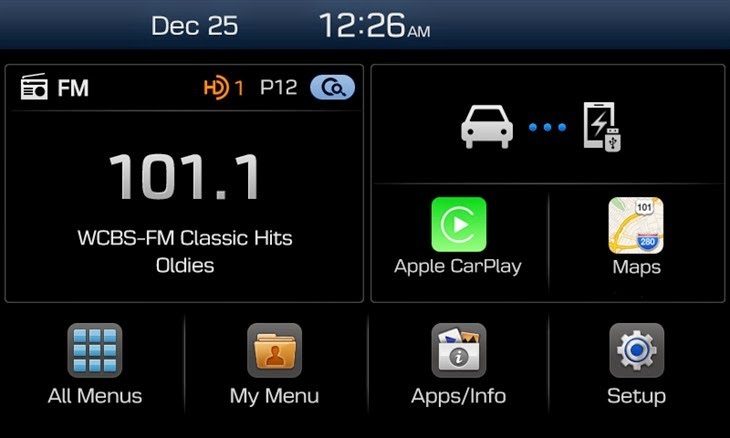 Following the CarPlay launch, Hyundai confirmed it would integrate CarPlay in its 2015 Sonata line, although the feature has yet to made available in those vehicles.